Program 106: Health and Healing | Wisdom of the Elders, Inc. The long days of summer, where we’re active. We’re fully engaged. We’re at the height of manifesting our vision. Summer is the time of youth. Summer can be the time of passions. We’re living at our fullest. We’re extended. We’re out. We’re embracing community. It’s a time to interact with all of our relations and to be very active in service and participate in the long, yellow days of summer. If you look at a society like our, the American society, the mainstream society, you can guess which direction or which season, as a culture, mainstream society likes to stay in. It’s summer, youth. It’s “let’s stay active. Let’s stay youthful. Let’s stay young.” Those are all good things. However, we miss the gift of maturity. We miss the gift of contemplation, reflection. We miss the gifts of moving into the role of being of service. We miss the gifts of letting go, of releasing, letting things move on. And so we kind of get stuck. As a society you can see it in the youth culture. As a country there’s a certain immaturity. We stay caught up in emotional passions. And mature into the wise elder. And to mature and grow and become the wise elder means, we have to move through the west to come to the north, and dream again and begin all over again with fresh vision, fresh inspiration, new knowledge, and things to share when spring comes again. And so the plants follow this cycle. In gathering plants you can follow the medicine of the plants with the seasons. If you’re going to gather St. John’s Wort, which is a beautiful little yellow flower, sometimes called Klamath weed around here. It blooms in June and you’re gathering the fresh flowers before they’re pollinated, which means you’ve got to beat the bees to it. You’ve got to have the time. You’ve got to set the priority to be out in the garden, or to be out in the wild to gather your St. John’s Wort buds. And so the energy for that plant has moved to the flowers, as all plants do in summertime, spring and summer. Early spring, the energy is in the shoots, the greens. So if you’re gathering, that’s where the medicine will be. That’s where the energy’s moving. Flowers in the summer, and in the fall. Some seeds, the fruits as they come into full bearing, it is the time to gather them. When the energy starts to move back into the root – if you’re gathering energy or medicine if you are gathering plants for root medicine – you might be digging roots in late fall or some do that in early spring, depending upon the plant, depending upon the person, depending on the land where you are. The plants will let you know. Herbal medicine is becoming very popular. There’s been a huge increase in the demand for doctors to be able to use plant medicine or herbal medicine in conjunction with their conventional medicine, which might be drugs. I’m going to use hypertension as an example, high blood pressure. Often someone will be given high blood pressure medication and then a diuretic. And the diuretic, which causes one to keep from retaining water, tends to deplete the body of minerals and vitamins, and so often someone who is given a diuretic will be given potassium to take, other minerals, vitamins, but mainly minerals to supply what the diuretic is just washing out of the body. And there’s some wonderful natural diuretics, like dandelion leaves that are high in minerals. They’re high in potassium and other minerals. There are some wonderful herbs for hypertension itself, like hawthorn berries. However, they have found that more medicine is in the flower and leaf, and so usually hawthorn flower, leaf and berry make a nice combination as a tea. You can have hawthorn berry jam. I love to make hawthorn berry jam with rose hips. You can do rose hip and elder berry and huckleberry and hawthorn berry jam, and it’s a wonderful elders’ tonic. Actually, anybody. I do add some honey. Honey and maple syrup seem to work better, for a lot of native people, than cane, sugar cane sugar. And that’s a nice substitute, with recipes, or to still have that sweet. I mean, it’s still a sugar, honey and maple syrup are but i have found that uh, people can handle the maple syrup and the honey better. And so, wonderful jams that you can make. If you’re going to gather hawthorn for hypertension, or a heart tonic, in general, the flowering happens in spring. And the berries happen later in the summer. So, in this case, you would be gathering – pinching, just pinching – the flower, with a few leaves around it and letting that dry. And then later in the year, in the summer, coming back and gathering the berries. And then drying them. And then mixing them together, you’ve got your complete hawthorn tea. With each breath, with each step, in every moment, may you all be well, eat well, be joyful, and create beauty wherever you go. Osadadu. Plant medicines are some of our most sacred and powerful teachings. And we are grateful to our herbalists who maintain that knowledge. 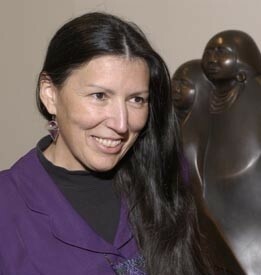 Judy Bluehorse Skelton teaches at conferences and workshops, and at the clinic of the national college of naturopathic medicine in Portland, Oregon.